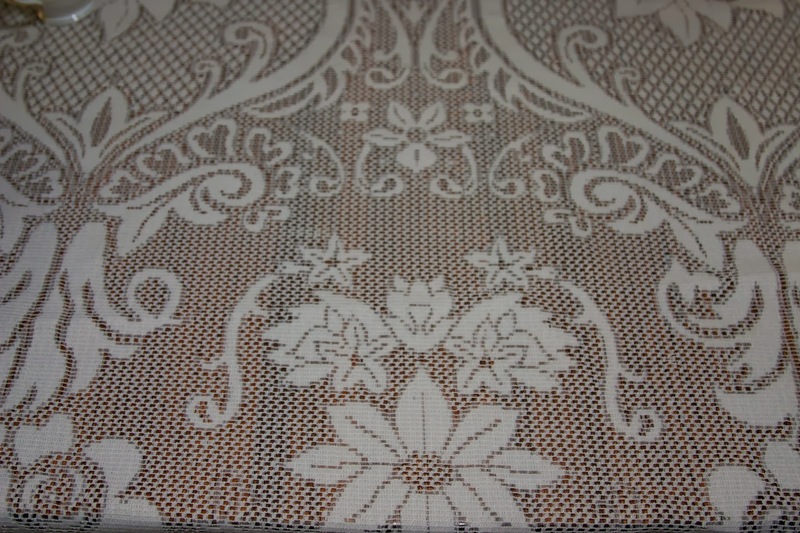 I started with a cream-colored lace tablecloth. 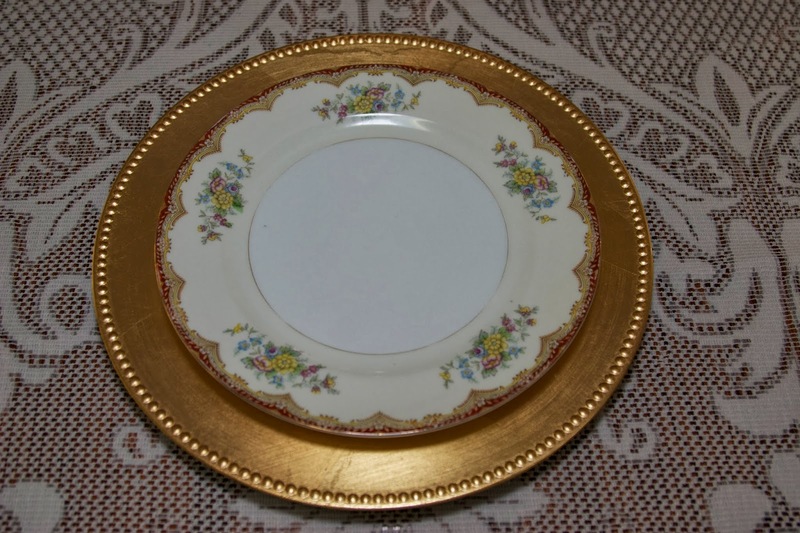 I felt that the delicate pattern around the plates' borders would be best complemented by a vintage feel to the table. I started my dish stack with a gold charger from Big Lots. 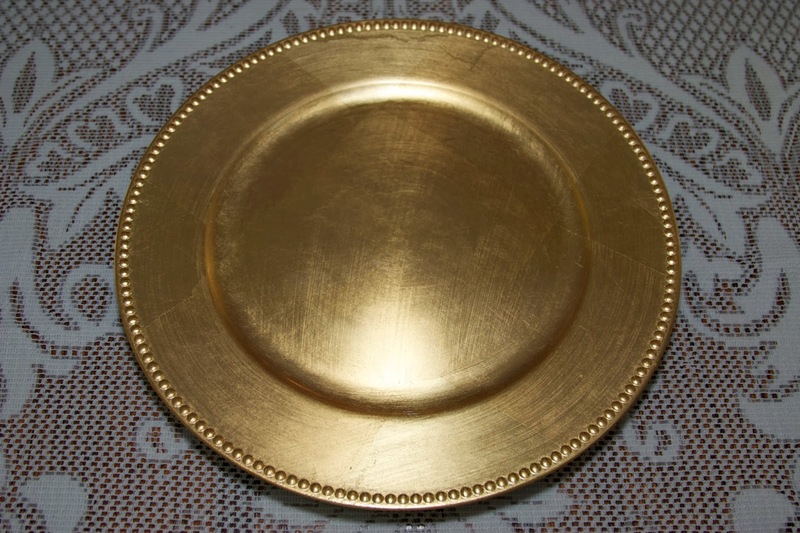 There is a small band of gold around the plates, and the chargers accent this. The dinner plate comes next. See the pretty floral pattern? And note the bi-color of the plate. The center is white, but a cream color extends to the edge. It is labeled Kikusui China, Made in Japan. My friend told me these plates were used as "everyday" dishes. Next comes the bread and butter plate. 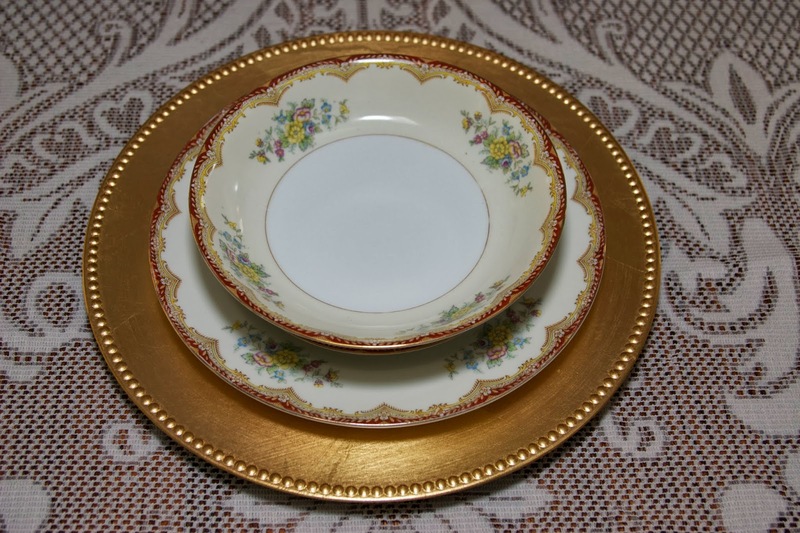 In this setting, I opted to use the small plate as a salad plate, instead of its intended use; hence, its placement in the dish stack instead of at the top of the place setting. The soup bowl comes next. This is the total place setting. It is completed with gold stainless flatware that was loaned to me by my cousin. 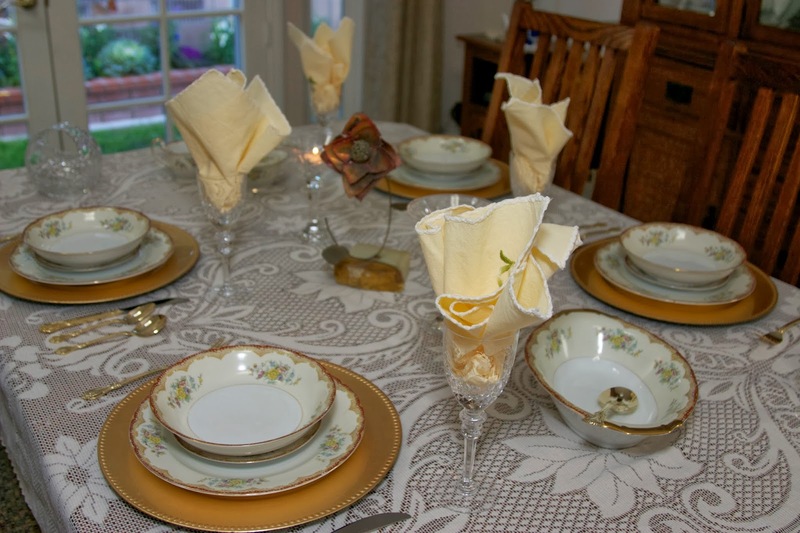 My Mikasa stemware holds a yellow linen napkin that mirrors the yellow flowers in the floral swag of the plates. 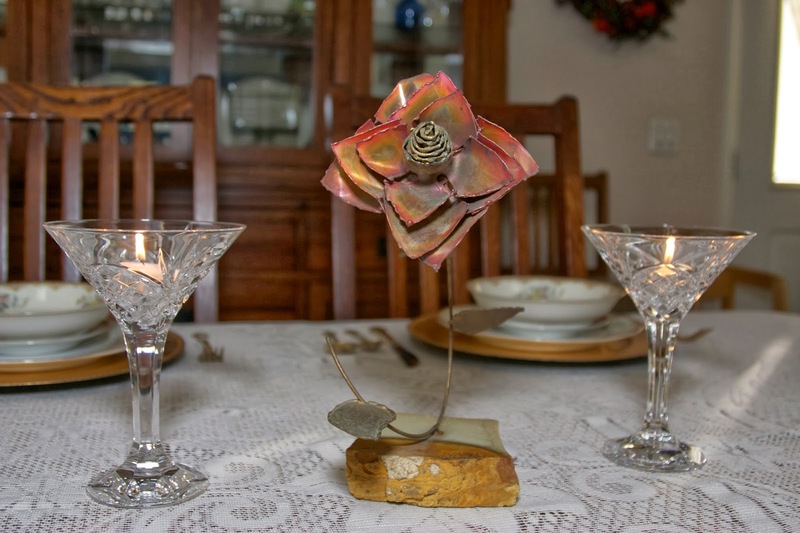 My centerpiece consists of a crimson metal-crafted rose sculpture that stands on a marble base. This was a gift from my husband when we were dating, and I treasure it. Since this table reflects sentimentality, it seemed fitting to include it. I also felt that the crimson color of the flower went well with the crimson color in the border of the plates. 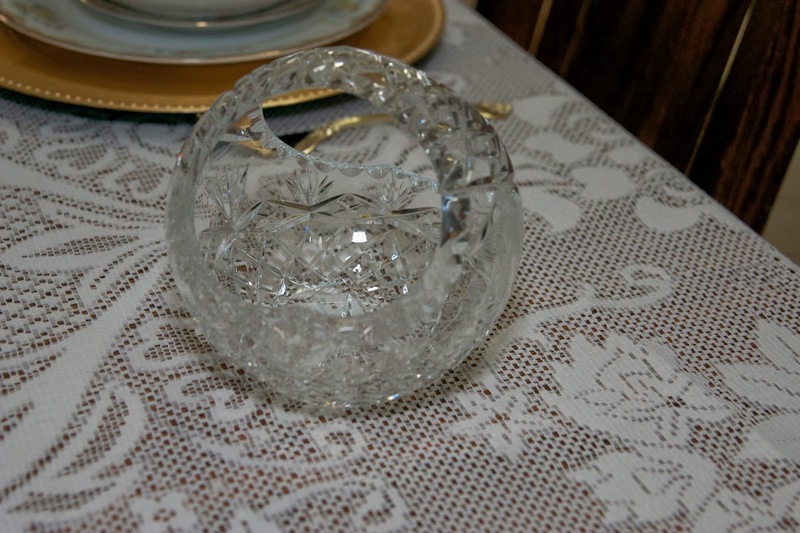 I used crystal martini glasses as tealight holders, because I remember that when Miya came to visit her daughter, we would enjoy her company having cocktails together before dinner, and be enchanted by her life stories and sweet laughter. 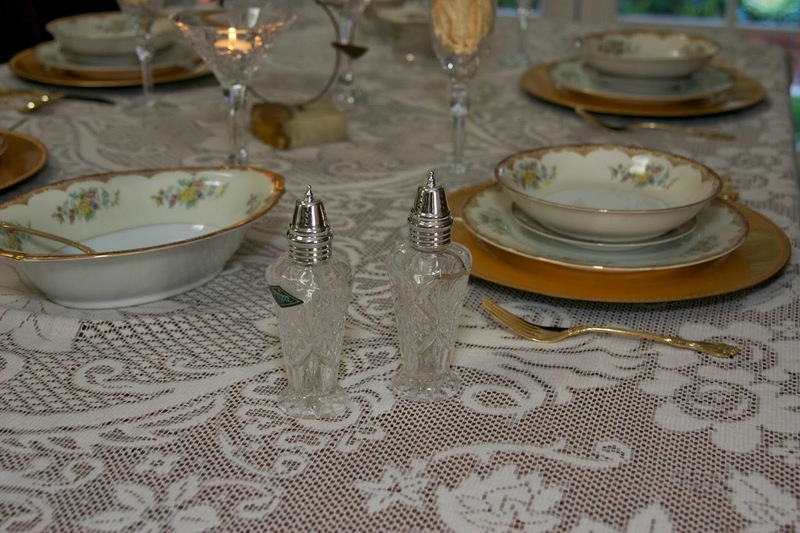 I added additional crystal accents to the table to achieve a formal feeling to the entire tablescape. 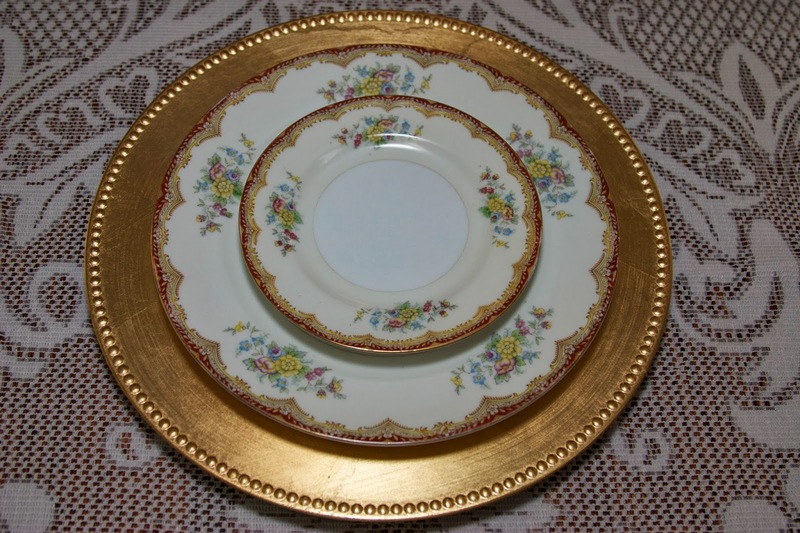 I hope that I have honored the memory of this very special lady by highlighting her lovely china that she shared with her family every day. 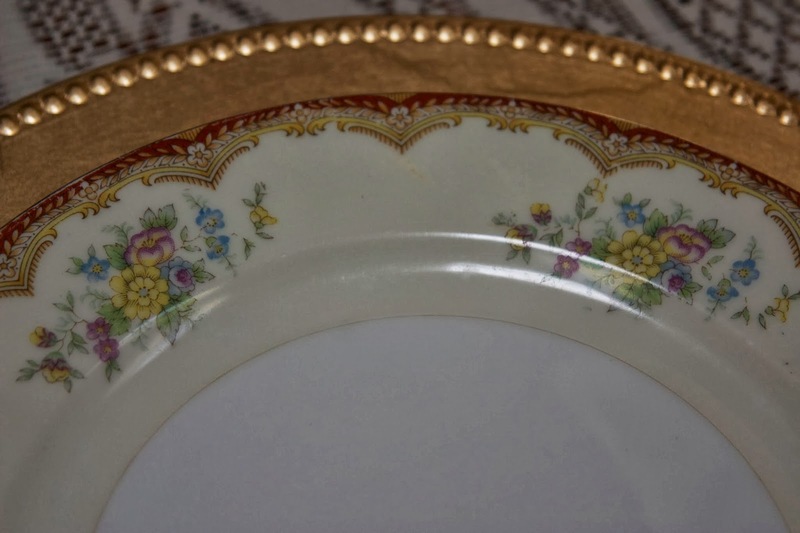 I'm sure there are many memories associated with these dishes that saw and heard many years of family joys and sorrows as they gathered around the table. When you think of it, that's why this hobby is such a special one. We create special havens for our families to come to the table and be a part of a moment in time that is the history and fabric of a family. Maybe that's why dishes mean so much to us: they are not just vessels of different shapes and colors to hold food, but palettes that reflect our family gatherings. And this was Miya's table. 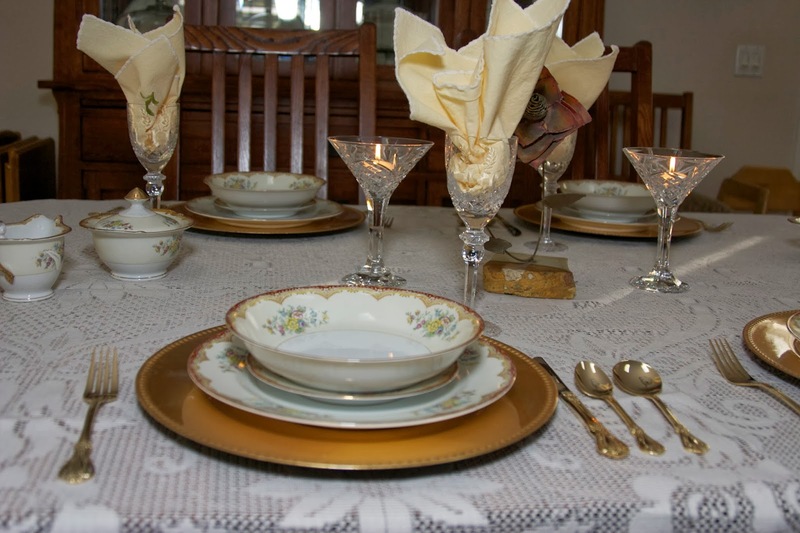 I'll be joining Susan at www.betweennapsontheporch.net for Tablescape Thursday. Be sure and stop by to see all the wonderful postings there! I love reading your comments. Thank you in advance. If you would like to know when I've completed a post, just go to the top of my blog by "Follow by Email", list your email and hit "Submit". Thank you for following me! What a lovely tribute to Mia! 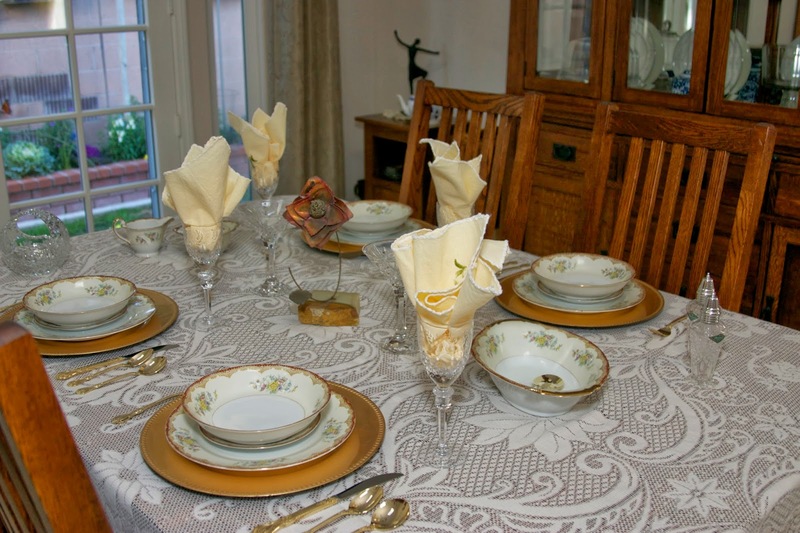 I know your friend will enjoy seeing her mother's beloved dishes on such a pretty table! I also enjoyed reading about your thought process as you set the table. Love the use of the martini glasses! Such a lovely tribute and such a pretty table with a lot of sentiment attached. The faceted martini glasses are stunning with the tealights in them as well. I signed up to follow you on Google + -- can't wait to get to know you better as you and I have very similar profiles. I'm a retired English teacher who formerly taught band and choir and I love tablescaping! You did a lovely job putting this memorial table together. I know how much these dishes mean to Mia's family. Lovely! Love the plates....You honored Mia beautifully.....I love when a tablescape not only spans generations but has memories of very special people.....just beautiful! 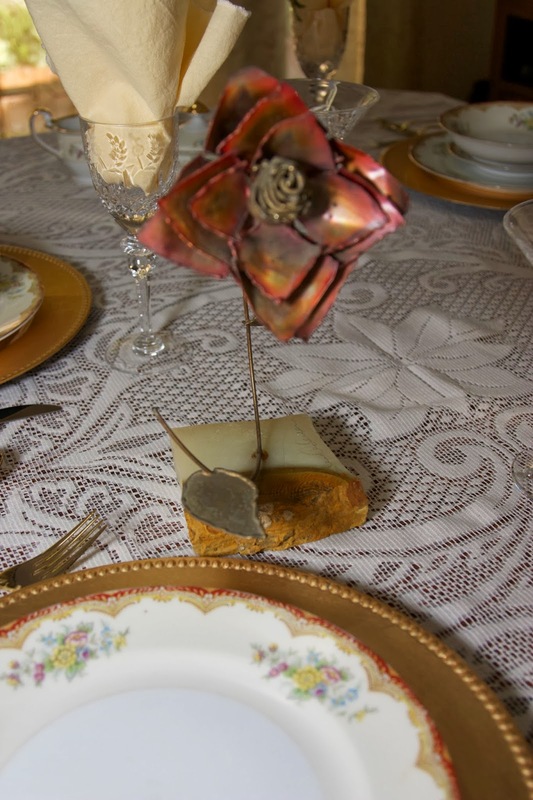 I love the metal rose! Lovely! Mia would be very proud of this beautiful table. How sweet to of you to create this lovely tablescape in memory of your neighbor Miya. 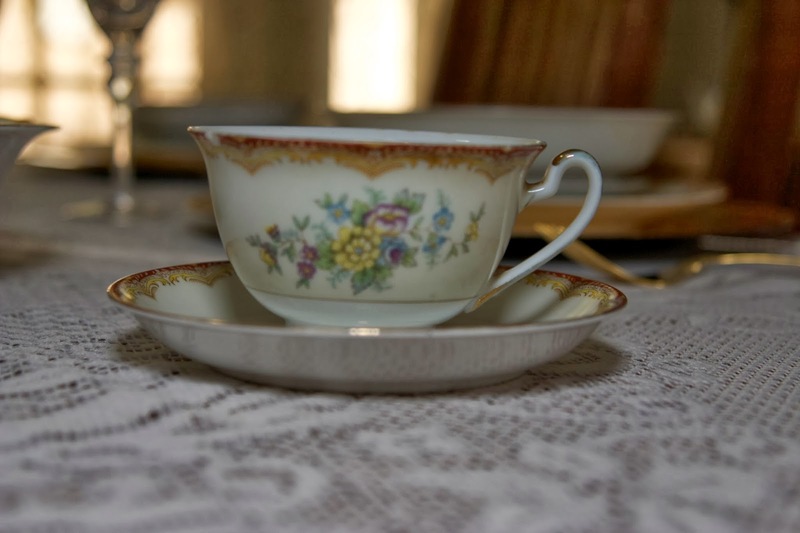 Many of my best loved possessions were passed on to me from family, friends, and neighbors through the years. I love your crimson rose and the candles in the champagne glasses. What a lovely tribute. I'm sure this meant a lot to your neighbor. Beautiful. Absolutely beautiful. 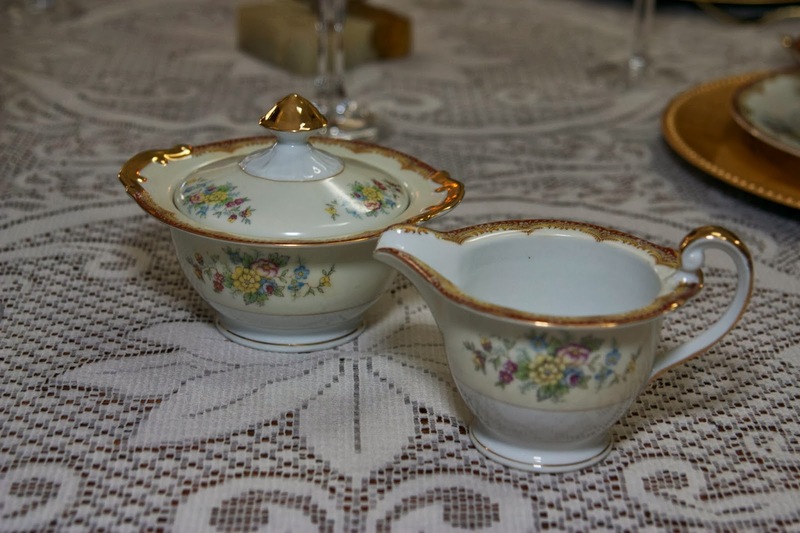 Reminds me of dishes my nana had and we used on holidays! Beautiful!!! Reminds me of my nana's dishes on Easter holiday!